All times are departures. See each routes schedule for year-round service, except for the holidays as noted below. There is no bus service on the following holidays: New Year's Day, Martin Luther King, Jr. Day, Memorial Day, Independence Day, Thanksgiving Day and the day after Thanksgiving, Christmas Eve, and Christmas Day. For further information, call: 864-654-2287. All CAT schedules may be accessed on the internet at www.catbus.com. 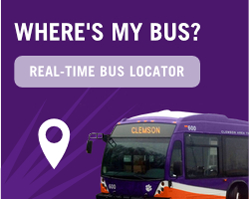 Clemson Area Transit is a public service provided fare-free by Clemson University, the City of Clemson, the Town of Central, the Town of Pendleton, the City of Seneca, the South Carolina Department of Transportation, and the Federal Transit Administration. All CAT buses are equipped to accommodate individuals with disabilities, and the general public. Individuals with disabilities needing other than regular route service must be certified with present verification for disability. For disability certification information call CATbus at (864) 654-2287. NO smoking, open food/beverages, bleach or harsh chemicals allowed on bus. Children under 10 years of age must be accompanied by a guardian (18 years or older). Radios or other media may not be played on the bus. Buses will not stop to pick up or drop off passengers at locations deemed unsafe by the bus operator. Buses on the Clemson University Campus will stop only at specified locations. Once the operator has closed the doors and the bus has started into motion it will not stop again until it reaches the next safe bus stop. Passengers should remain seated or be holding onto straps. Passengers may not stand forward of the safety line. Passengers should refrain from engaging in conversations with the bus operator while the bus is in motion. Clemson Area Transit is not responsible for items left on a CAT bus. If you lose an item you may call (864) 654-2287. Items are kept in Lost and Found for 30 days. After 30 days, items are given to a local charity. Items can be picked up at 200 West Lane, Clemson between the hours of 8am and 5pm Monday through Friday. The CAT bus system is made up of several connecting routes. It may be necessary to transfer from one bus to another to complete your journey. The hub of the CAT system is at Bryan Circle on Cherry Rd. Under NO circumstances should you cross in front of or chase a CATbus! Always stand/wait on the side of the road that the bus is traveling towards your destination. Clemson Area Transit is committed to ensuring that no person is excluded from participation in or denied the benefits of its services on the basis of race, color or national origin, as provided by Title VI of the Civil Rights Act of 1964, as amended.